Home / Worth writing about… / All / We have gone international! 01 Jan We have gone international! The Craftivist Collective now includes LA baby! Ellen Schinderman is our LA Craftivist. Ellen emailed me when I was wrote my ‘A Lonely Craftivist’ blog and commmented on my blog. 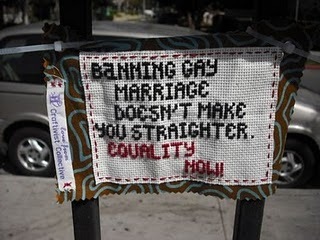 Ellen created a beautiful cross stitch graffiti piece and I thought it would be nice to post her a Mini Protest Banner Kit. She recieved it and then online pharmacy education sent me this photo of her protest banner creation. For our upcoming zine Ellen was kind enough to answer my emailed interview questions so get ready to read more about her. In the meantime check out more about this incredible lady as a blogger, tweeter, craftivist and craftster.